MANILA, Philippines - The official results, list of passers, top 10 lawyers, among other important announcements for November 2017 Bar exams are released by the Supreme Court (SC) of the Philippines on April 26, 2018, five (5) months after the lawyers' licensure exams. 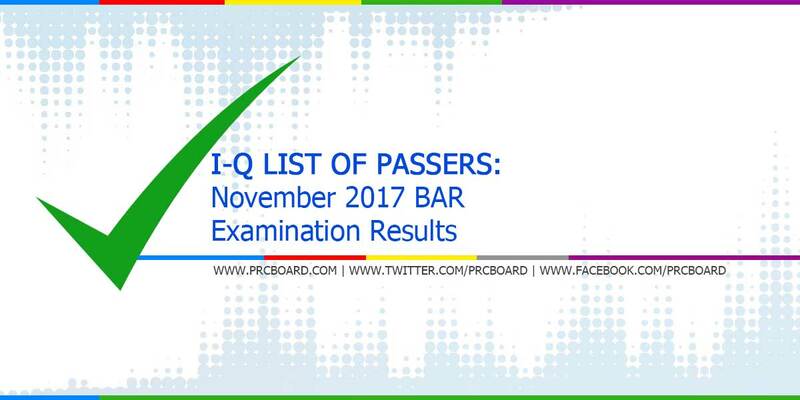 Below is the list of passers for November 2017 Bar exam with surnames starting with letter I to Q. Bar Exams is one of the country's popular licensure exams being administered by SC and Office of the Bar Confidant for growing number of aspiring lawyers. For 2017, Bar exams are scheduled on all Sundays of November 2017 at University of Santo Tomas (UST). The official list of passers will be posted by the Supreme Court on the pre-announced date of release. The names will be posted at SC official website and will also be flashed via widescreen at SC's front yard. Likewise, results will also be posted here upon issuance of the Supreme Court. To receive updates on any announcements about November 2017 Bar exam results, we advise our readers to bookmark this page, visit PRC official website or follow us at our social media pages via Facebook and Twitter.